Emerald Downs’ offers four stakes races Sunday, including the final local tune-up for the $200,000 Longacres Mile (Grade 3) next month. A compact field of five older runners square off in the $50,000 Mt. Rainier Stakes at 1 1/16 miles, while older fillies and mares meet in the $50,000 Boeing Stakes at 1 1/16 miles. The 10-race card also features the first 2-year-old stakes of the season, colts & geldings racing 5 1/2 furlongs in the King County Express and fillies going 5 1/2 furlongs in the $50,000 Angie C Stakes. A special $0.50 Pick 4 will be offered on the stakes quadruple-header, encompassing races 5 through 8, beginning with the Mt. Rainier, followed by the Angie C, King County Express and Boeing. In the Mt. Rainier, Riser drew the outside post and attempts to cross the wire first for the third consecutive time at the meet. 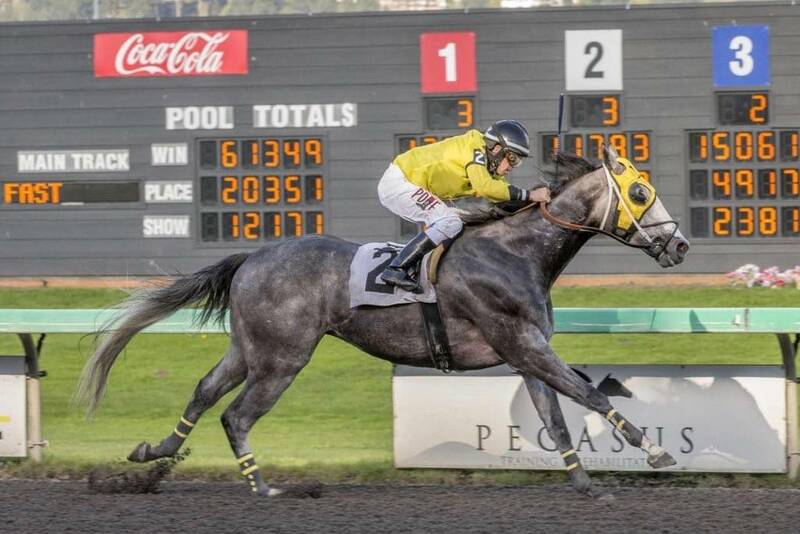 The gray 4-year-old has the two biggest Beyers this season, recording a 92 while winning the six-furlong Governor’s in 1:08.23 and a 91 while running 6½ furlongs in 1:15.65 in the Budweiser. Riser was disqualified for interference in the Budweiser, with Dedicated to You promoted from second to first. Riser is the controlling speed again Sunday, and has fared well around two turns in the past, most notably a gate-to-wire victory in last year’s nine-furlong Emerald Downs Derby. Dedicated to You, Barkley and defending Mt. Rainier champion Mach One Rules will be waiting in the wings Sunday, ready to pounce if Riser tires in the stretch. Opportunistic appears outclassed, but the 5-year-old gelding has a good two-turn history including a victory over Barkley in the 2016 Emerald Downs Derby. The field for Sunday’s 23rd running of the $50,000 Mt. Rainier Stakes, 3-year-olds & up, 1 1/16 miles, Race 5, 4:03 p.m.: 1-Dedicated to You, Rocco Bowen, 124 pounds; 2-Barkley, Javier Matias, 120; 3-Opportunistic, Kevin Orozco, 120; 4-Mach One Rules, Isaias Enriquez, 120; 5-Riser, Juan Hernandez, 124. The field for Sunday’s 23rd running of the $50,000 King County Express, 2-year-old colts & geldings, 5½ furlongs, Race 7, 5:07 p.m.: 1-Baja Sur, Erick Lopez, 120; 2-Jackwain, Rocco Bowen, 120; 3-Verynsky, Gary Wales, 118; 4-AZ Dreamer, Julien Couton, 118; 5-This Great Nation, Anne Sanguinetti, 118; 6-Sky Confidential, Kevin Orozco, 118; 7-Jack Van Berg, Javier Matias, 118. The field for Sunday’s 23rd running of the $50,000 Boeing Stakes, 3-year-olds & up, fillies & mares, 1 1/16 miles, Race 8, 5:37 p.m.: 1-Blazinbeauty, Isaias Enriquez, 119; 2-Reginella, Juan Hernandez, 119; 3-No Talking Back, Anne Sanguinetti, 117; 4-Sheeza Sassy Girl, Julien Couton, 121; 5-My Heart Goes On, Gary Wales, 120; 6-Top Quality, Kevin Orozco, 121; 7-Jerre to Carrie, Javier Matias, 117; 8-Racy Rascal, Rocco Bowen, 117. Isaias Enriquez returns to ride Mach One Rules in the Mt. Rainier Stakes. The 2013 Emerald Downs’ riding champ scored three stakes wins last year on Mach One Rules, including the Mt. Rainier Stakes, but currently rides in New Mexico. Washington-breds have won five of the first 10 stakes this season: Sippin Fire (2), Invested Prospect (1), Bella Mia (1) and Dedicated to You (1). Average field size is 7.4 runners in stakes races, and average win payoff is $11. Betting favorites are 4 for 10 in stakes. Hall of Fame jockey Julie Krone, celebrating the 25th anniversary of Colonial Affair’s victory in the 1993 Belmont Stakes, will make an appearance Sunday at Emerald Downs. Krone, who rode 3,704 winners, will sign autographs and also serve as honorary steward for the $50,000 Mt. Rainier. Krone remains the only woman rider to win a Triple Crown race, and was the first woman jockey to win a Breeders’ Cup race, capturing the 2003 Juvenile Fillies on Halfbridled. Patrick Henry Jr., who went down hard in a dramatic spill Sunday, will resume riding with three mounts Friday, according to agent Keith Drebin. … First-time starter Jack Van Berg, entered in Sunday’s $50,000 King County Express, is named in honor of the Hall of Fame trainer who passed away earlier this year. The 2-year-old To Honor and Serve colt is owned by Mike Waters, for whom Van Berg trained the last several years in Arkansas and Kentucky. … Los Alamitos wraps up its brief three-week Thoroughbred meet Sunday, with Del Mar opening its 79th season Wednesday. 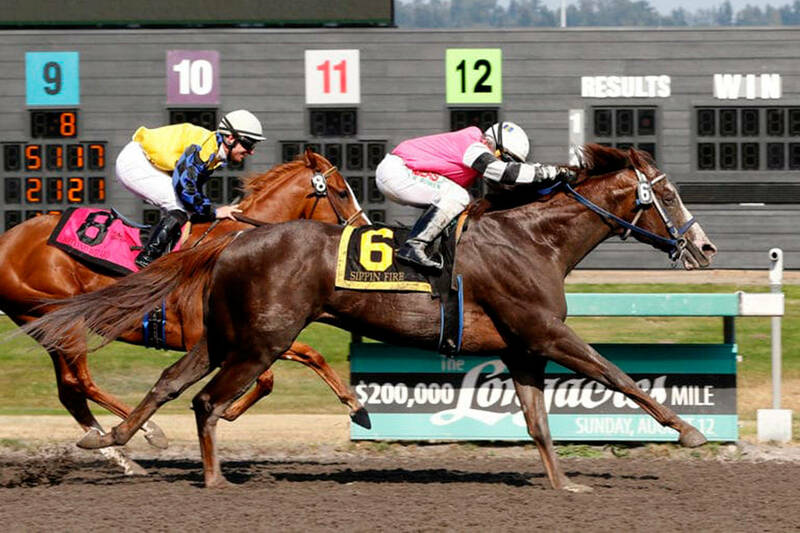 … Washington State Legislators Stakes winner Alliford Bay has shipped to Golden Gate Fields, but trainer Blaine Wright still has three older fillies and mares in the Boeing Stakes – Reginella, Sheeza Sassy Girl and Top Quality.